I Love My Job - When You Love Your Job. "Wow, guess what we did at work today?" The days I know someone, at a San Diego company, goes home and thinks to themselves, or asks a friend or spouse, to "guess what we did at work today!". My heart is happy. It means work - worked. I spent enough of my career in business, and HR, to know, the company plays a role or has a responsibility to promote an individual's wellbeing when they are at work. Truth is, I've gotten in my car, driven from my home, with so much anxiety, stress, and physical tension going into an office some days. Granted some days were great, and some companies gave me room to learn and grow, and I still keep many of the friends I made along the way, so there that. But, that sinking feeling, seeing other people put work first, let their wellbeing, health, happiness go, be tired, be resentful even - and companies not helping. That will get me fired up. LIfe is too short to not love both work-life, and life. Good news: There are organizations, many right here in San Diego, leading the charge, who get it! Keep people happy, at work too - treat their "work-life" like real life. Create awesome works spaces, perks that foster good habits, healthy environments, give people skills and outlets, and guess who keeps their staff? Guess where healthy happy people want to be hired? Take a workplace where you have worked, or your friends spend time. Are people happy? Do they say good morning? Are people learning new skills, being creative, and grabbing a Keifer soda or green juice on tap? Seriously, it's a thing! Do they do walking meetings? When you walk in, is it inviting? re people trusted? Over the last 15 years, I've met the coolest industry professionals, speakers, health food companies, yoga experts, ergonomic providers, medication leaders, app for challenges, tech startups, fitness devices who let me give them away and provide discounts, organizations that need volunteers, the list goes on. So my "job". . .
Share it. Share the information. Share the contacts. Share the discounts, events, and resources. Want to do a hike? Or what about a stretch or non-scary meditation, call Melody. Yoga, call Lauren, or work-in with Julia! A speaker - the list goes on. A session on Courage - ask Ryan. An ergonomic desk or succulent wall - take your pick. A 5K or team building event? A way to volunteer? A challenge that is affordable? 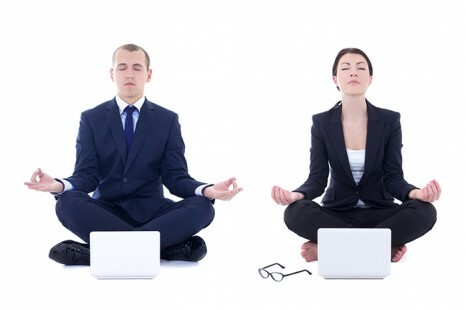 Awesome - the best corporate wellness programs do some of all of it. I make sure, and it's often at a discount, but it's priceless because - I have awesome friends. More good news. I made it my life's work to enable companies, leaders, HR, and entire organizations to make work - a place that makes you feel valued, alive and dare I say ... happy to be at work. It's possible. This Friday, I have collected the best resources to share with wellness ambassadors and local companies who wish to be part of the conversation. The meeting space is gorgeous. Lunch is organic from Trilogy Sanctuary in La Jolla, with an ocean view, at 12:15PM. Meeting follows. While I look through the awesome swag bags (thank you local healthy products from sunscreen to snacks, essential oil kits, to 5k walks!) that's just a perk - not the reason to come, but they do rock. Kashi, Saje, Coola, SD Running Co, Mobile Massage, but I don't want to spoil it. Instead of going to only my corporate cleints, or sharing one at a time - we've created a 4 hour workshop, with healthy lunch to do just that. Share, inspire, and equipt those who are responsible for their staff - with the tools to do just that. I can't wait. I say "we". SSA- three career women who live personally healthy lives, believe in helping their clients and organizations be well! So they are on board! They provide health benefits, but believe in preventative wellness too, my type of women! I'm excited about it, knowing attendees will be inspired to go back to work, to make everyday, a little better for those who spend much of their lives, together, at work.